Providing adequate life support is one of the big problems of Space exploration. The Space station has the ability to recycle some of its resources such as water but still depends on resupply. That option would be much more difficult for a Mars mission or a Moon base so NASA and other space agencies have been developing Advanced Life Support Systems . Such systems would use biological systems (plants) to provide essential consumables including food. 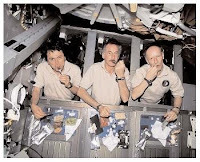 Now I know astronauts s like growing fruit and vegetables in Space, not only does it provide fresh food but it promotes their psychological wellbeing. However, I'm less certain they would enjoy food preparation. I certainly doubt they would have the time to make a good job of it. Call me a cynic and a sceptic if you like, but I fear after a few weeks of having engineers and pilots cooking they would produce something fit for Gordon Ramsay's Kitchen Nightmares. To prevent such horrors a Mission Nutrition Specialist is required ie: a cook. Cooks have traditional been an essential members of exploratory expeditions. One of the most famous was Adolf Lindstrom. He was the cook for the great polar explorer Roald Amundsen and went on both the North West Passage and South Pole expeditions. Admundsen regarded Lindstrom as the most important member of his crew. He knew tasty nutritious meals would be essential for the crews morale and good health. The polar explorers hunted their meat and ate it undercooked to prevent scurvy, Lindstrom was a master at cooking undercooked meat. 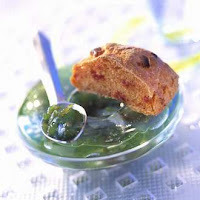 Martian bread and green tomato jam', 'Spirulina gnocchis' and 'Potato and tomato mille-feuilles' are three delicious recipes that two French companies have created for ESA and future space explorers to Mars and other planets. "We are aiming initially at producing 40% locally for astronauts' food on future long-duration space missions, for example to Mars," says Christophe Lasseur, ESA's biological life-support coordinator responsible for recycling and production of air, water and food for long-term space missions. "Why 40%? By growing enough plants to cover around 40% of what we eat, we also get 'for free' the oxygen and water needed to live", explains Lasseur. So although it will be a while yet before Chef Ramsay opens a Lunar City restaurant I think theres a need to get some real chefs up there to do some experimental cooking.